When The Force Awakens was released in 2015, fans loved it: “Thanks, JJ Abrams, for going back to the Original Trilogy!”. Yet fans were a bit irked too: “It’s A New Hope reskinned for the 21st Century! !” What people didn’t realize is that both the love and this feeling of déjà-vu came from the same place: all the Star Wars movies follow the same patterns, and The Force Awakens even more tightly than other movies. How close is The Force Awakens to other Star Wars movies? Why? 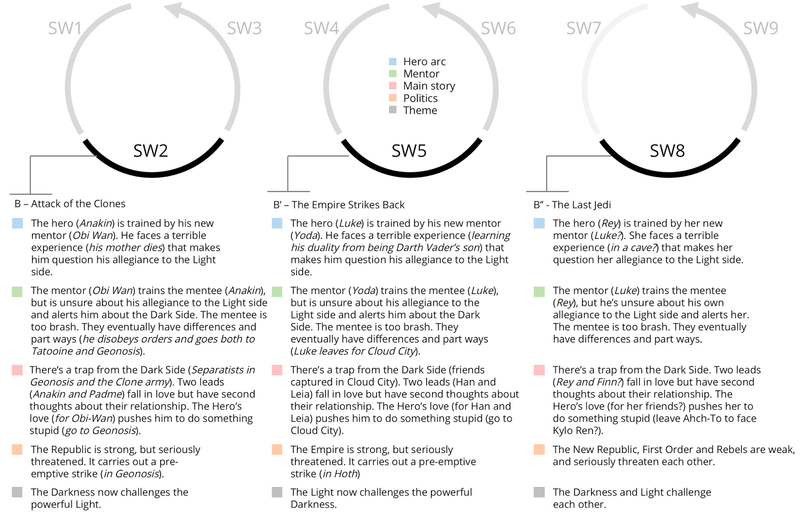 And if all seven movies follow these patterns… The Last Jedi will too. 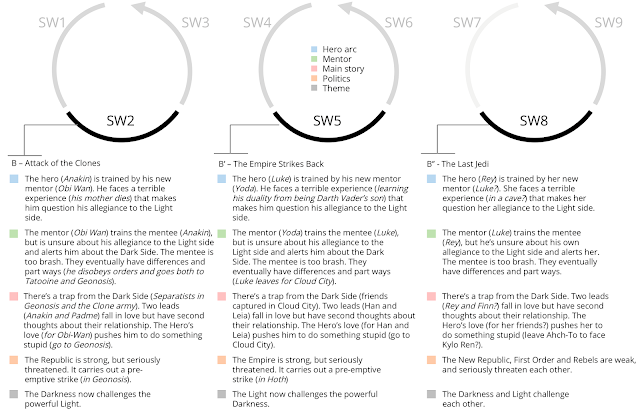 What if we could predict what happens in The Last Jedi following these patterns? Let’s look at all these questions. 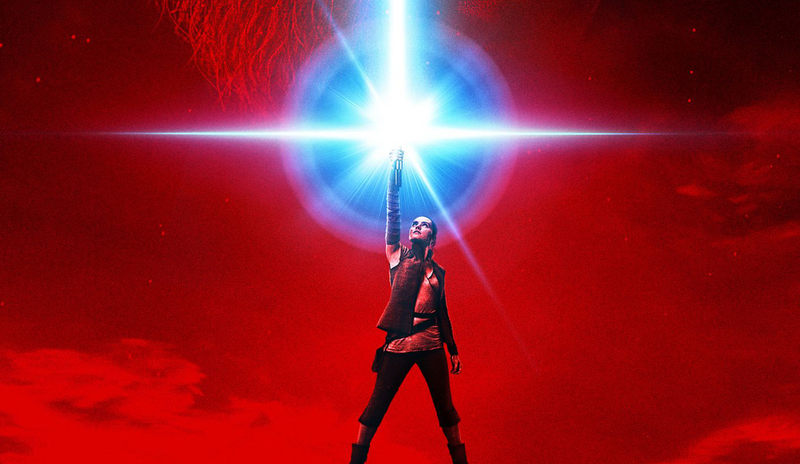 Fans have already noticed how similar The Force Awakens and A New Hope are. 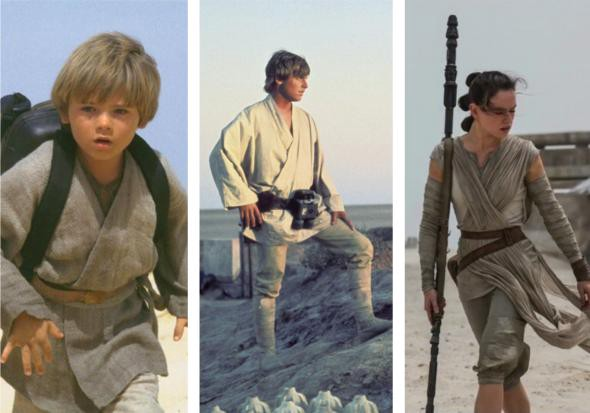 From a young hero starting off in a broken family in a desert planet, to a planet-like machine that destroys worlds, the list of similarities between the two movies is staggering. The Death Star and Starkiller Base are famously similar. But the similarities are not just superficial. The plots are nearly identical. Leia introduces a secret into a small rolling droid that doesn’t speak, R2D2. Darth Vader and his Stormtroopers chase the droid to find the secret. They kill everybody on their way and take a prisoner to find the secret, Leia. Kylo Ren and his Stormtroopers chase the droid to find the secret. They kill everybody on their way and take a prisoner to find the secret, Poe. We discover a young desert boy, Luke, who works with droids in a life he hasn’t chosen. We discover a young desert girl, Rey, who works with droids in a life she hasn’t chosen. Leia tries to resist Darth Vader’s interrogation and succeeds. Vader decides to chase the droid. Poe tries to resist Kylo Ren’s interrogation but fails. Kylo decides to chase the droid. Later on, Rey tries to resist Kylo Ren’s interrogation and succeeds. A couple of partners, R2D2 and C-3PO, land on the desert planet. A couple of partners, Poe and Finn, land on the desert planet. The desert boy, Luke, stumbles upon a droid, R2-D2. The desert girl, Rey, stumbles upon a droid, BB-8. Luke is tempted by the Rebellion, but wants to remain on the desert planet because he has duties there. Rey is tempted by the Resistance, but wants to remain in the desert planet because she has duties there. The Millennium Falcon is dysfunctional, but the droid, Luke, and Solo use it to escape in extremis the attack of Stormtroopers. The Millennium Falcon is dysfunctional, but the droid, Rey, and Finn use it to escape in extremis the attack of Stormtroopers. The crew plays a chess game. The crew retrieves the same chess game. Rey receives Anakin’s lightsaber later on. The crew goes to a cantina full of outcasts in Mos Eisley. The crew goes to a cantina full of outcasts in Maz Kanata’s castle. The Millennium Falcon’s controls are overridden by another ship. It gets captured. A very old man, the Emperor, is at the head of the Dark Side and drives his black-hooded Sith, Darth Vader. A very old human figure, Snoke, is at the head of the Dark Side and drives his black-hooded Sith, Kylo Ren. The Death Star destroys a planet to show its power. Starkiller Base destroys five planets to show its power. The ship’s crew witnesses how the young Jedi mentor, Obi-Wan, dies facing a Sith, Darth Vader. The ship’s crew witnesses how the young Jedi mentor, Solo, dies facing a Sith, Kylo Ren. The Death Star is destroyed with a master shot from an ace pilot, Luke. Starkiller Base is destroyed with a master shot from an ace pilot, Poe. The parallels are so stark that people missed another one: The Phantom Menace. The key plot points of The Force Awakens are also identical to The Phantom Menace. A poor boy lives in a broken family in a desert planet. He has great skills handling robots, and a special gift as a pilot. A poor girl lives in a broken family in a desert planet. She has great skills handling robots, and a special gift as a pilot. Two representatives of the broader world appear in his life and shake his world: Qui Gon Jinn and Obi-Wan Kenobi. Two representatives of the broader world appear in his life and shake his world: R2D2 and C3PO. Two representatives of the broader world appear in her life and shake her world: Finn and BB-8. The boy gets recruited with the promise of becoming a Jedi by his original Jedi mentor, Qui-Gon Jinn. The boy gets recruited with the promise of becoming a Jedi by his original mentor, Obi-Wan Kenobi. The girl gets recruited by the original mentor, Han Solo. Han Solo has ties with the Light Side of the Force that she craves. The original mentor dies in a lightsaber fight with a Sith, and is replaced by a second mentor, Obi-Wan Kenobi. The original mentor dies in a lightsaber fight with a Sith, and is replaced by a second mentor, Yoda. The original mentor dies in a lightsaber fight with a Sith, and is replaced by a second mentor, Luke Skywalker. The boy joins the Rebels and fights against the Dark Side. The girl joins the Rebels and fights against the Dark Side. A big enemy ship, the Trade Federation’s, attacks the good guys’ planet, Naboo. A big enemy ship, the Death Star, attacks and destroys the good guys’ planet, Alderaan. A big enemy ship, the Starkiller Base, attacks and destroys the good guys’ planets, the entire Hosnian system. The boy is key in the destruction of the ship. The girl is key in the destruction of the ship. Why are all three movies so similar? Because the similarity shows how history repeats itself, with small variations in each instance that lead to widely different outcomes. The parallels highlight the differences. Anakin and Luke could have both ended on the Light Side of the Force, but small differences led to very different outcomes—Anakin ended on the Dark Side because of his mother’s death and the fear that his love, Padmé, would die. These repeating patterns are called Rings. There are rings everywhere in Star Wars: for the protagonists, mentors, secondary players, themes, politics… George Lucas was very purposeful in these Rings. For him, they were like poetry. Every movie rhymes with the next one. And if history repeats itself across Rings, we can predict that The Last Jedi will follow the same blueprint as The Empire Strikes Back and Attack of the Clones. By simply uncovering the patterns in Star Wars, we can have a pretty good guess about what’s going to happen in The Last Jedi. Let’s take Rey as an example. The end of The Force Awakens reveals that she’s now secluded in a planet full of water with a Jedi Master in his later days, Luke. This is exactly like when Luke goes to Dagobah, a planet full of water, to visit another old Jedi Master, Yoda. Obi-Wan also visits a watery planet in Attack of the Clones, Kamino. Many revelations in The Last Jedi’s first trailer were similarly predictable, such as the conflict between Luke and Rey, or a battle between the Light Side and the Dark side on a desert planet, such as Geonosis in Attack of the Clones or Hoth in The Empire Strikes Back. This approach confirms other speculative plot points. For example, it’s likely that there will be a trap from the Dark Side, like in Coruscant in Attack of the Clones or Cloud City in The Empire Strikes Back. This fits well with what we know about Finn, Rose and DJ in the world of Canto Bight. Finally, this approach can probably predict things that haven’t been teased anywhere. For example, Rey will probably question her allegiance to the Light Side around the middle of the movie, like Anakin when he sees his mother die or when Luke has the vision of his face inside Darth Vader’s helmet in Dagobah. Similarly, we can also predict that Rey will learn something about her family that will influence her stance about the Light and Dark Sides. Thankfully, we can’t predict everything. There are plenty of things to discover in the movie. We can’t predict who is Rey’s family, but whether she is Obi-Wan’s daughter or Kylo Ren’s twin sister, we can predict it will impact Rey’s outlook on the Force. Old Star Wars movies don’t dictate the future movies, but they help us narrow down the options. Like a new stanza of a poem, we know what rhymes The Last Jedi it will have, we just don’t know its verses yet. You can read more about Star Wars’ structure, how it helps us predict the next movies, and much more in the book The Star Wars Rings, from Tomas Pueyo, on presale now, launching Sep 19 2017. Join the launch party on Facebook that day, between 10am and 6pm PCT! Kylo Ren is not a Sith! Using the Dark Side aggressively does not make you a Sith. And he only uses a red lightsaber to imitate his grandfather. Kylo/Ben is a KNIGHT OF REN. The movie itself explicitly stated that! Or rather, Snoke does. who is going to lose a hand in TLJ?